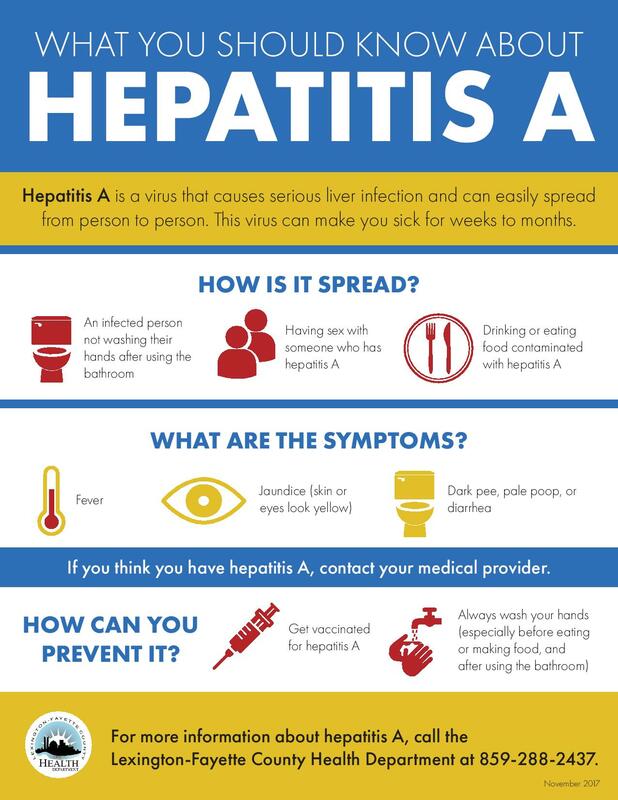 (Updated April 15, 2019) Hepatitis A is a liver disease that can easily be passed from person to person and can be spread through close contact with someone infected with it. Washing your hands with soap and warm water after using the bathroom, changing a diaper or before making food and drinks can help stop the spread of hepatitis A. More than 4,504 cases have been reported across Kentucky since the fall of 2017, compared to around 20 cases that are typically recognized each year. There have been 53 deaths associated with hepatitis A in this outbreak. Though the outbreak was initially centered in the Louisville area, outbreak-related cases have now been reported in 107 counties across the state, including Fayette. Learn more about which counties have hepatitis A in this Kentucky hepatitis A report. The best prevention is with a hepatitis A vaccination. 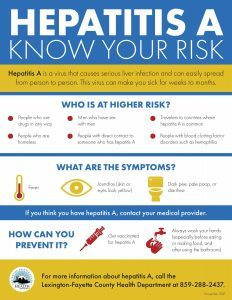 The hepatitis A vaccine, given in two doses six months apart, is available from some medical providers and many pharmacies in Lexington and is covered by most insurance plans. The vaccine is also available at the health department’s Public Health Clinic by appointment. Call 859-288-2483 to check availability and to schedule an appointment. 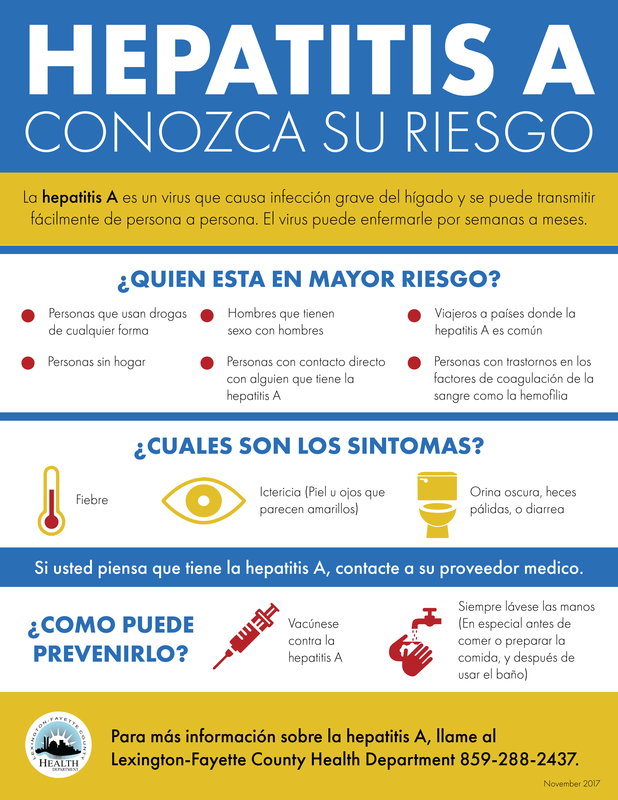 You can learn more in our Hep A Q&A! Starting in the 2018-19 school year, Kentucky students are required to have the vaccination. Please check with your medical provider to see if your child has been vaccinated. 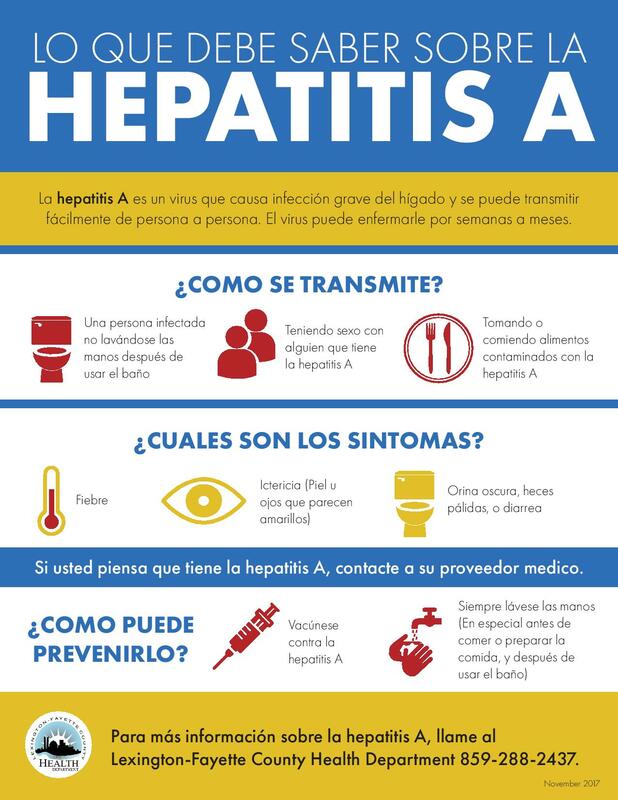 You can learn more about hepatitis A in this interview from Healthy Times, our radio show on Lexington Community Radio: hepatitis A interview. Please check out our new page with frequently asked questions about hepatitis A: hepatitis A FAQs. 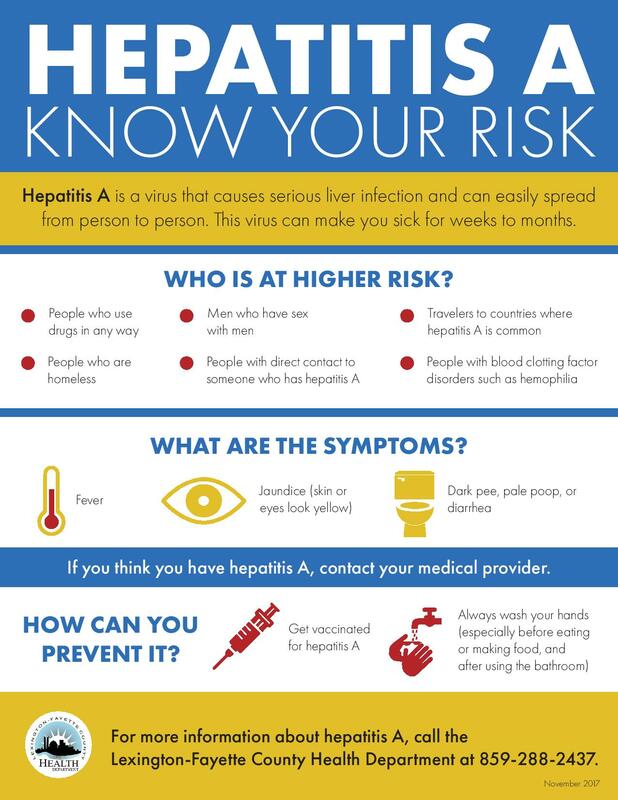 The Lexington-Fayette County Health Department is urging providers to vaccinate all adult patients against hepatitis A, not just those in a high-risk category. Consider providing Twinrix® to those who have previously not been vaccinated for hepatitis B. 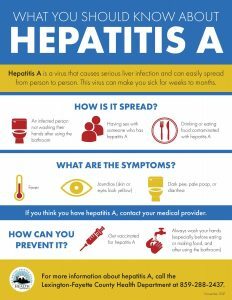 Per Immunization Regulation 902 KAR 2:060, two doses of hepatitis A (HepA) vaccine will be required for all children aged 19 months through 18 years who attend daycare, primary and secondary school beginning on or after July 1, 2018 for the 2018‐2019 school year. Children aged 12 months through 18 months will require one dose of HepA vaccine. Providers should now catch‐up children aged two years and older to assure hepatitis A immunity. 2019: A New Year, A New You! Start 2019 with better health! Let our experts help you eat better, exercise more, stop smoking and more! Call us at 859-288-2446 to learn how to be a healthier you in 2019. We have several FREE classes coming up in 2019, so check out our calendar on the home page for all the ways we can help you this year! 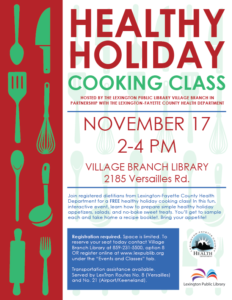 You can learn more here: Community Health Equity and Education. Flu shots are now available in our Public Health Clinic! 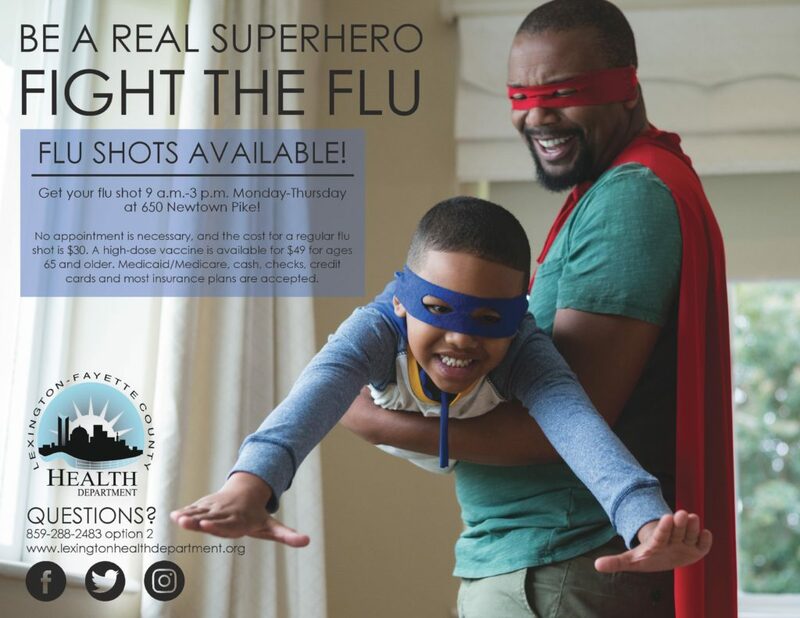 The health department offers flu shots 9 a.m.-3 p.m. Monday through Thursday at its Public Health Clinic at 650 Newtown Pike. No appointment is necessary, and the cost for a flu shot is $30. A high-dose vaccine is available for $49 for ages 65 and older. Medicaid/Medicare, cash, checks, credit cards and most insurance plans are accepted. “A seasonal flu shot is recommended to all people ages 6 months and older and is the best way to avoid getting the flu,” LFCHD spokesman Kevin Hall said. Last flu season, Lexington had 27 deaths from flu-related causes. For additional information about the 2018-19 flu season, like the Lexington-Fayette County Health Department on Facebook, or follow us on Twitter at and Instagram at @lexpublichealth. Flu information can also be found by calling the Public Health Clinic at 859-288-2483. Protect your family this Thanksgiving with these tips! 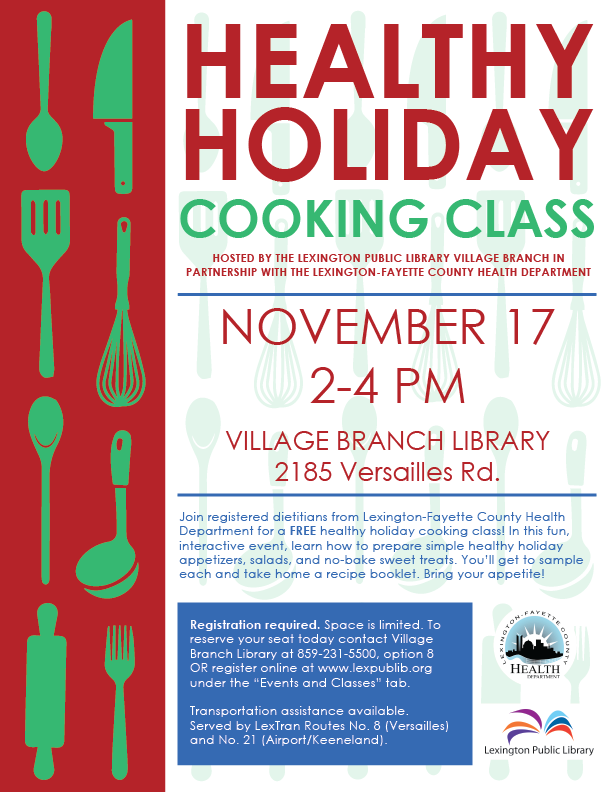 As many prepare to share holiday meals with family and friends, the Lexington-Fayette County Health Department recommends these safe food handling tips. Foods that have been sitting out for too long can be sources of bacteria that can potentially cause foodborne illness, which affects an average of 76 million people each year. Be wary of any foods — hot or cold — that have been left out for more than two hours. This so-called “danger zone” when food is between 40 degrees Fahrenheit and 140 degrees allows bacteria to multiply. Any perishable foods should be discarded after remaining for two hours at room temperature. Wash hands – Wash hands for 20 seconds with soap and water following restroom use, before preparing foods, after handling raw meat and before eating. Clean – Wash and sanitize food-contact surfaces often. To sanitize utensils, immerse for 30 seconds in clean, hot water at 170 degrees Fahrenheit, or immerse for at least one minute in a solution containing one teaspoon of 5.25 percent household bleach per gallon of water. Bacteria can spread and get onto cutting boards, knives and counter tops. Wash fruits and vegetables before preparing. Thaw properly – Proper methods for thawing a turkey include thawing in a refrigerator with a temperature of 41 degrees Fahrenheit or less (allow 3-4 days for thawing); placing under cool running water at a temperature of 75 degrees Fahrenheit or less; or thawing in microwave and cooking the turkey immediately. Take temperatures – Cook turkey at 325 degrees Fahrenheit until the internal temperature reaches at least 165 degrees Fahrenheit. Cooked, hot foods should be kept at 135 degrees Fahrenheit or warmer. Be sure to use a food thermometer to check temperatures. Keep it cold – Cold foods should be kept at 41 degrees Fahrenheit or less. After the turkey is served, immediately slice and refrigerate on shallow platters. Use refrigerated turkey and stuffing within three to four days. Use gravy within one to two days. If freezing leftovers, use within two to six months for best quality. Transport safely – Keep hot foods hot and cold foods cold. Reheat – Leftover turkey and stuffing should be stored separately in shallow dishes or platters. Rapidly reheat leftovers to a minimum internal temperature of 165 degrees Fahrenheit. When in doubt, throw it out – If you are unsure of how long a particular food item has been left out at room temperature, the best thing to do is discard the item. The Lexington-Fayette County Health Department wishes you a safe and happy holiday. For more information about food safety, please contact the Division of Environmental Health and Protection at (859) 231-9791. Protect your family and friends this Thanksgiving: don’t prepare food if you are sick! Kentucky is in the middle of the nation’s worst hepatitis A outbreak, and it can be spread through handling food when sick. 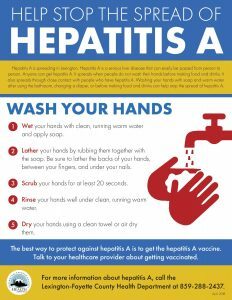 Be sure you’re also washing your hands frequently (especially after using the bathroom), and talk to your pharmacist or medical provider about getting the hepatitis A vaccine. 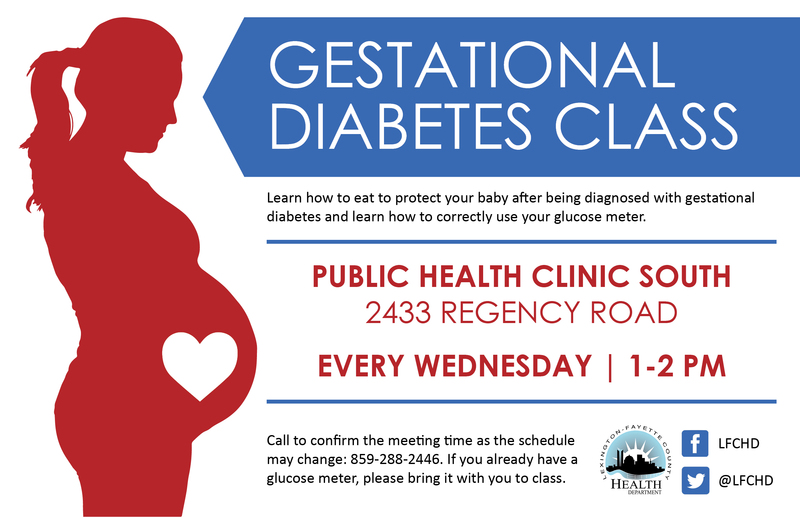 You can also call us at 859-288-2483 to make an appointment – no walk-ins will be accepted. Each November is designated National Diabetes Month. It’s a time to bring attention to diabetes and its impact on millions of Americans. 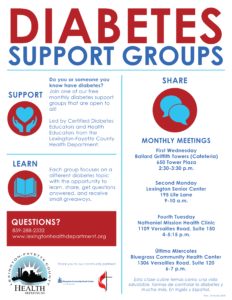 Here in Kentucky, 1 in 8 adults has diabetes, but many more have it and don’t know it. To learn if you or someone you know may be at risk for developing type 2 diabetes, take a simple 60-second, 7-question risk test here at the American Diabetes Association website. You can also learn more in our Facebook Live broadcast! 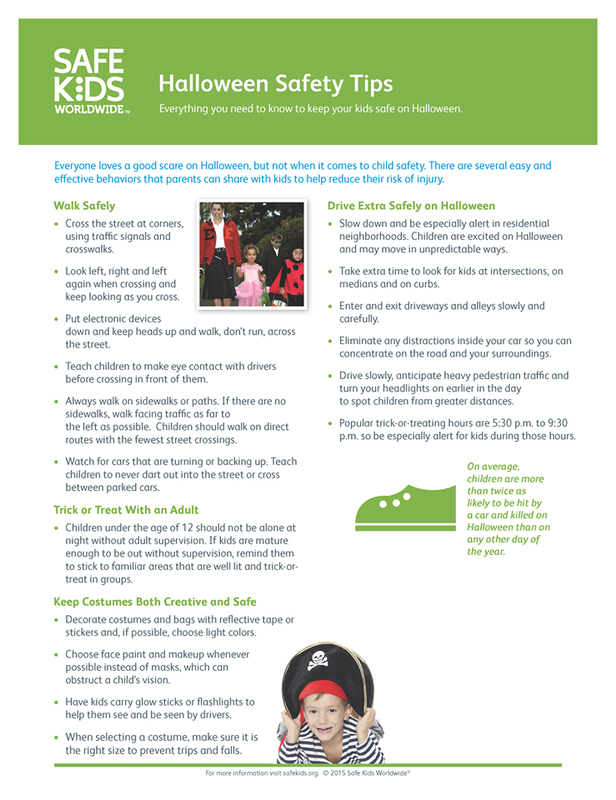 Don’t say ‘boo’ to these Halloween safety tips! 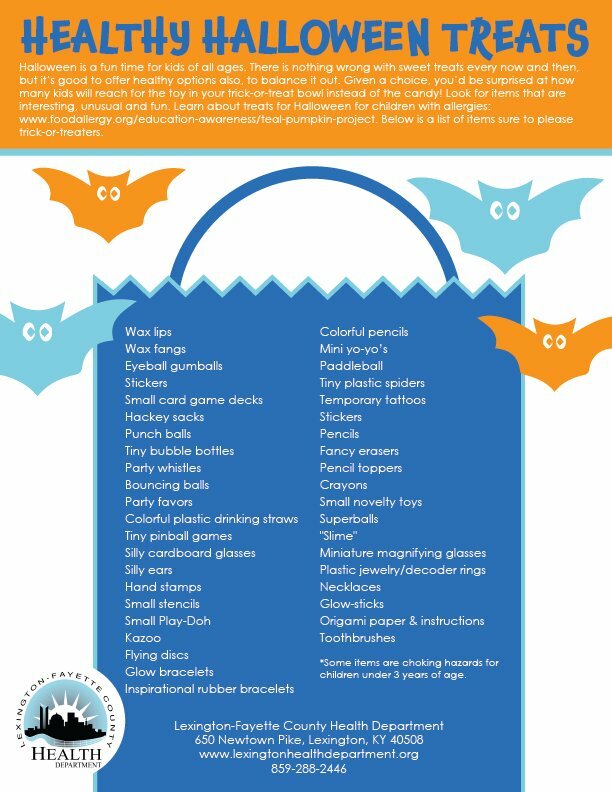 Halloween can be scary enough as is, so take steps to keep it from being even more frightening! Kids are more than twice as likely to be hit by a car and killed on Halloween than on any other day of the year. 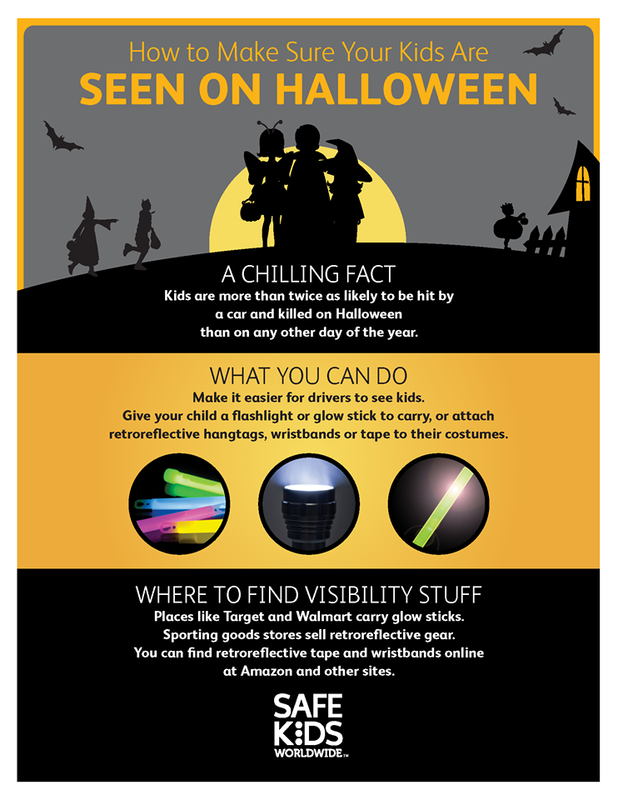 Make it easier for drivers to see your kids by giving your child a flashlight or glow stick, and attach reflective tags or wristbands to their costumes! Learn more from the CDC! You can also use these suggestions for healthier snacks/treats for your visitors!